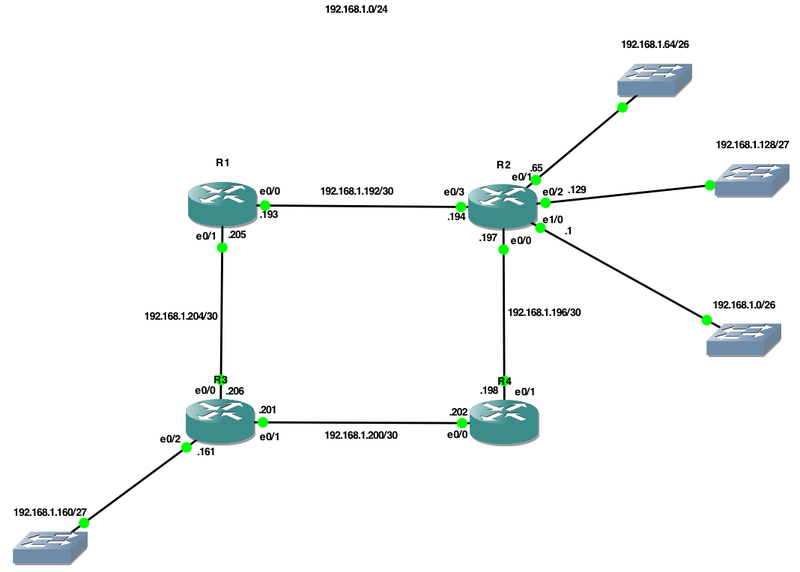 Configuring EIGRP Part 2, Practical. | Kingsmich LLC. 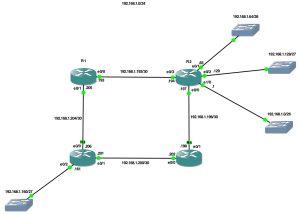 Home › Uncategorized › Configuring EIGRP Part 2, Practical. First I configure EIGRP on R1 on just one interface (linked to R2). I have used 10 as the AS for EIGRP, this must be the same for all the routers. I have turned off auto-summary so I can have better control of summarisation. I use some show commands to check its running on just the specified interface. I can also see that there are currently no neighbors. I now enable EIGRP on R2 and I see the adjacency form. Back on R1 i check the neighbor table. Checking the route table on R1 i can also see the EIGRP route. On R4 I enable EIGRP. And on R3 I enable EIGRP. From R3 I check the routing table and I can see routes to the all the other networks I have configured so far. What is missing from my routing table is routes for all the networks hanging off R2. This is because I used the wildcard mask of 0.0.0.0 to specify that EIGRP only ran on certain interfaces. To enable EIGRP for all networks on R2 I will add a new network with no wildcard mask. This is similar to commands used when setting up RIP. Now when I check the routing table on R3 i can see all the new networks attached to R2. Now I can see all the networks. I want to test my reliance between R3 and R2. To do this I will test connectivity and then shut down an interface on R4. Hopefully routing will continue. R3 can ping R2 successfully. Now I shutdown R4′s interface. Pings fail! I check R1 and find that it is only routing for network 192.168.1.192 (on interface 192.168.1.193). I add the other interface into EIGRP for AS 10. Back on R3 I attempt to contact R2 again. * Good Credit to SynJunkie for excellent work of this cause.